Despite the season only being seven games old, the form of both Woking and Billericay Town saw the game billed as an early six pointer in the race for the National League South title. With eleven wins and twenty-nine goals between the two teams in just fourteen games before kick-off, both sides have shown superb moments of quality in their quick starts to the season, and three points would put the winners top. There was no shortage of drama in the build-up to the game either, with Billericay co-owner Glenn Tamplin reported in the press to have sacked successful manager Harry Wheeler by text just before their first loss of the season a week earlier, reinstating himself as manager. Whilst the decision proved fruitful last week with, Billericay coming from behind to beat St. Albans, he and his team unable to avoid defeat this time. After a cagey first half that saw the two teams level through two penalties converted by Jake Robinson and Max Kretzschmar, the dismissal of Tambeson Eyong for a second yellow saw a tight game game swing in Woking’s favour. Kretzschmar would prove the difference-maker yet again for the Cards, firing in the rebound from Armani Little’s long-range drive with eighteen minutes to go, and putting Woking five points clear of the visitors at the top of the table. The game began with Woking fans in excellent voice, but it was Billericay who arguably started the brighter. Grenadian international Ricky Modeste sliced an early effort wide, before a dangerous cross evaded Jake Howells in the Woking penalty area. Woking responded with an effort from range from Nicky Wheeler, well charged down by the Ricay defence. The first clear-cut chance of the game would produce the first goal, with Modeste again proving the instigator. The Woking backline was caught napping in allowing a long and high ball to bounce in front of them, and good work from Robinson down the Woking left led to Modeste bundled over by Ferdinand inside the box. There was little doubt that Robinson would score, and the striker took his tally for the season into double figures by rifling low into the corner, sending Schotterl the wrong way. It wouldn’t take long for Ferdinand to make up for his potentially costly error, however; only four minutes later, the midfielder was pushed to the ground inside the area by visiting captain Danny Waldren as Woking floated in a free kick from the left-hand side. Waldren was booked for the challenge despite furious remonstrations with the referee and would have been incensed even further to see Kretzschmar smash the penalty past Alan Junior, despite the keeper diving the right way. Two goals in the first quarter of an hour would lead fans to expect a very exciting game, but in truth there was little further of note in the first half. The game descended into something of a slugging match, with both teams a little nervous to play their game after early setbacks, and not wanting to over-commit against an opposition who were capable of punishing them. Moments of exciting individualism from Wheeler and Howells came to nothing, whilst Armani Little and Tambeson Eyong both picked up bookings for unnecessary challenges – perhaps karma for the latter, given the x-rated language he used loudly enough to draw gasps from the crowd around him. The half petered out with something of a whimper, leaving the possibility that either side could claim the points they valued so highly if only they could find a way of clicking through the gears. Billericay made one change at half time, bringing off Modeste for experienced forward Adam Coombes, and the former Hampton and Richmond man was immediately picked out in the Woking area to be denied at the last minute by Josh Casey. From the resulting corner, Jamie O’Hara had a first drive blocked before firing the second effort inches over Schotterl’s bar. Despite these early efforts, Woking had emerged from the tunnel slightly brighter than they appeared in their first half display. Kretzschmar was proving dangerous as ever from set-piece situations, and with the attacking midfielder deployed out on the right, Paul Hodges was suddenly relishing the space in the middle of the pitch, driving at defenders and forcing a decent if comfortable stop from Julian in the Billericay goal. Hodges’ major contribution, however, arrived just before the hour mark from a Woking break. Skipping around the challenge of Inman, the youngster was cynically blocked off by the shoulder of Eyong as he burst towards the Billericay D, and the faux incredulity of the defender was not enough to prevent referee James Durkin from producing a rightful second yellow. Tamplin scrambled to rebalance Billericay with his remaining substitutes, introducing Simon Walton for the veteran Jamie O’Hara, and then Alfie Potter for Sam Deering, who was booked for timewasting as he left the field. With Ricay reverting to a 4-4-1 formation to keep a sound defensive structure whilst retaining the dangerous Robinson up top, Dowse made his first change of the game, with the somewhat anonymous Greg Luer replaced by a focal point in Duane Ofori-Acheampong. 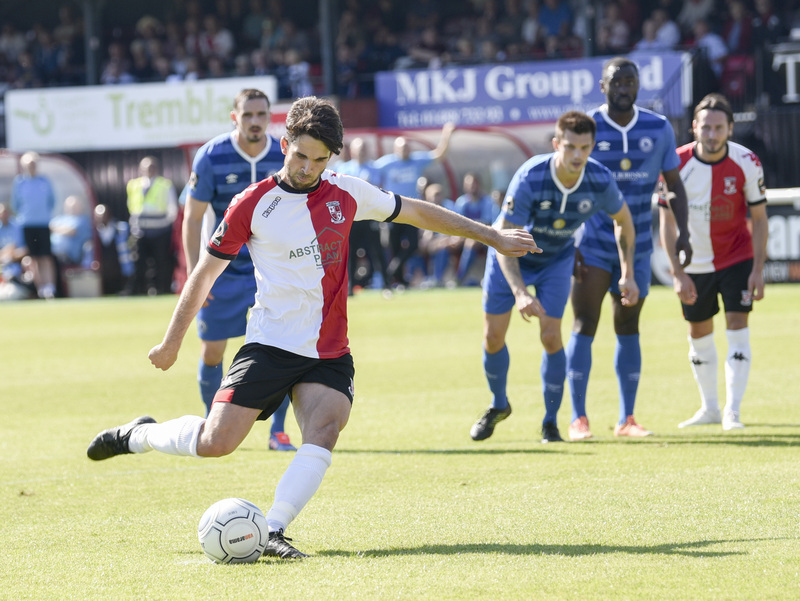 Despite the Billericay changes, Woking were understandably having much more of the ball with their one-man advantage, and it may have been those numbers that facilitated going ahead. Able to dominate possession in the Billericay third, an attack down the left with the combining Casey and Wheeler was recycled into midfielder, where Armani Little was given time to fire at goal from twenty-five yards, stinging the hands of Alan Junior with a drive that the keeper couldn’t hold. The palmed effort fell to an unmarked Kretzschmar drifting in from the right-hand side, who bundled the ball into a relatively empty net. There were blunt remonstrations from the Billericay players and staff – Tamplin, who viewed his technical area as a detail of no consequence, at the head – but the goal was allowed to stand. Woking had the opportunity to score a less contentious third, but their crossing was ultimately not at the quality it needed to be to punish Billericay in the final ten minutes, with Ofori-Acheampong somehow unable to be picked out both by direct cross or by knockdown. It was also noticeable that the frenetic pace of the game was slowed to suit the home side, and some of the fouls given to Woking were somewhat questionable. Alan Julian – ever viewed as the pantomime villain as an ex-Stevenage player - delighted the home fans by throwing himself to the ground in allusion to what he considered obvious dives on more than one occasion! Despite the levity, with the half wearing on and the visitors knowing they needed a goal to stay within touching distance of Woking on the league table, Billericay were able to force several chances to tie the game. The best of them fell to Adam Coombes, and can truly be considered a sitter; a long ball from Callum Kennedy, flicked on by Simon Walton, dropped to Coombes just seven yards out, only for the forward to bullet his header straight into the grateful arms of Berti Schotterl. Further efforts from Coombes and Walton were ultimately fruitless, and despite the palpable nervousness that you could sense in the Woking defence – particularly after a late injury to Kiran Khinda-John forced the introduction of Dan Spence, with Collier shifting to centre-back – the Cardinals held on for a huge victory in the race for the Vanarama South title. After the game, the Billericay manager expressed unhappiness with the refereeing performance and the nature of the Woking goals, but for Woking fans it means a five point gap at the top of the league, and seven wins from eight games at the start of a new era. Sponsors’ Man of the Match: Paul Hodges. The local lad seems to like the mistaken announcement of his name as ‘Hodge’ – it’s the third time that his superb performances have compelled sponsors to name him as man of the match! The youngster was one of the main outlets for the Cards in the second half, drawing a second yellow for visiting fullback Tambeson Eyong and making a number of dangerous runs to drive the home side forward and maintain pressure.